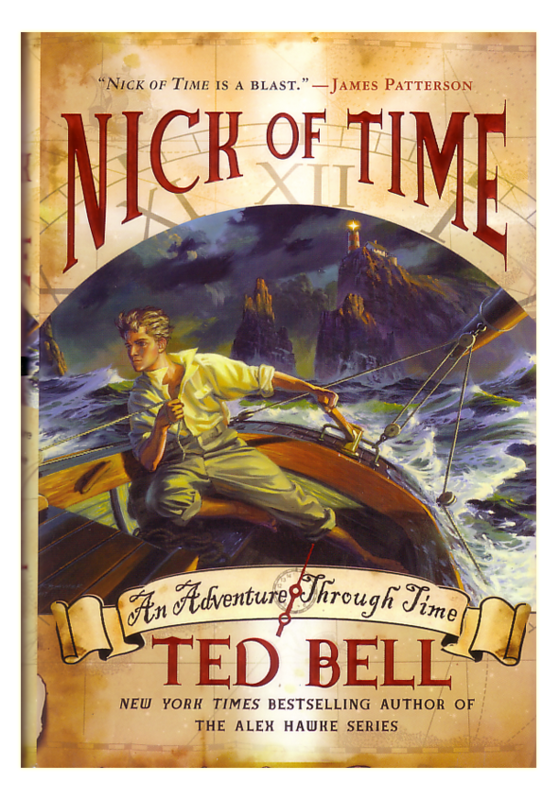 Nick of Time: an Adventure Through Time, by Ted Bell, is an aptly named book. Not only because its story involves time travel, but because the book itself seems like something from decades past. This is a proper boys’ adventure, full of ships, daring, submarines and heroes. Its very nature hails from an earlier time, making it a thrill and a delight to read. The majority of the story takes place in England, in the years just prior to the full breakout of World War 2. Nick and his younger sister, Kate, reside with their parents on Greybeard Island – a quaint, sleepy sort of community that’s also full of history, reefs, and shipwrecks – and also happens to be strategically useful to the growing Nazi threat. It’s troubling times, made all the more so by the political bickering in Parliament regarding what to do about the impending danger, or if such danger even exists at all. The suspense and stress of this pre-war environment as seen through the eyes of young Nick makes for a gripping narrative, and could very well have become a tale in and of itself. But Bell then throws a curve ball when Nick discovers an antique chest washed up on the beach – antique in construct, anyways, but in all other senses appearing brand new. That the chest is enscribed with Nick’s own name only adds to the mystery, as do the dangerous-seeming strangers Nick later meets who seem strangely determined to acquire said chest for themselves. Nick of Time is a layer of mysteries with each clue leading to the next in an increasingly thickened plot. Boyhood daydreaming leads to genuine wartime espionage, which in turn leads an even greater adventure as Nick discovers that he himself possesses a rare piece of antiquity – Leonardo Da Vinci’s solution to time travel. This story is a fantasy, surely, but one that is so grounded in real-world events that the reader begins to wonder how time-travel could possibly play a role without seeming entirely out of sorts. And yet, again, Bell pulls it off with surprising believability. And in this way, Nick of Time becomes two interwoven adventures in one – the first being of Nazi’s, top secret maritime vessels, and pre-war politics, and the second of naval battles in the age of sail. A tale of Admiral Nelson’s own navy. And, of course, a tale of pirates. Pirates who themselves posses a key to time travel, and who’ve used it in some of the most cowardly means possible to profit accordingly. Nick of Time is a brilliant read. Where many children’s stories actually take place in a children’s sort of simplistic world, Nick resides in the real world, more or less, chock full of all the dangers, dissappointments, unfairness, and other unfortunate realities that are a part of everyday live life. In this way, despite some of its unlikely occurances, Nick of Time remains a story that feels true, as if it could have happened to any of us, had fate seen fit to make it so. This entry was posted in Books and tagged nelson, sci-fi, ted bell, time-travel, young adult by Bilgemunky. Bookmark the permalink.